Finalist in the 19th annual Foreword INDIES Book of the Year Awards. e-Book: Available in Kindle and Nook versions. At the height of frontier expansion, Joshua Frasier comes West as a missionary to the Cheyenne Indians. He marries into the tribe and then is recruited as chaplain in the Colorado militia to fight on the edges of the Civil War and to deal with the “Indian problem.” Caught up in the military and political conflicts of Colorado’s push for statehood, Joshua’s faith and mettle are tested severely. This well-crafted story weaves both historical and fictional characters into the fast-paced action. The author balances a heart-wrenching tragedy of the West with human warmth, hope, and universal themes: In a clash of cultures, where do ambition, fear, and violence lead? And how is healing even possible? 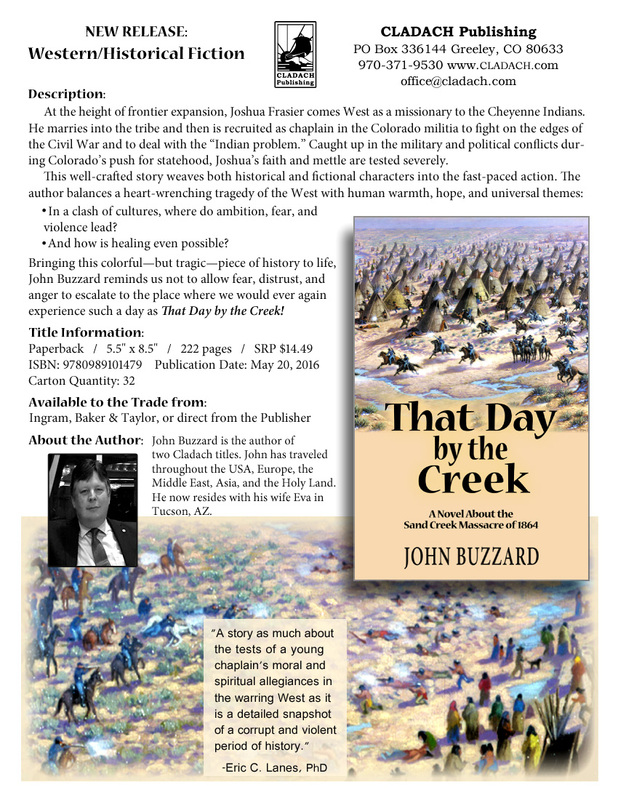 Bringing this colorful—but tragic—piece of history to life, John Buzzard reminds us not to allow fear, distrust, and anger to escalate to the place where we would ever again experience such a day as That Day by the Creek! Order/buy wherever books are sold. This program aired February 22, 2017. The interview starts at 11:55 minutes into the program. CS: Hello, John. I keep wondering what inspired you to write a novel based on the events of the infamous Sand Creek Massacre of 1864 Colorado?